"Ŝia recepto por kuko kun fragoj bongustas." Translation:Her recipe for cake with strawberries is delicious. I think that saying, "Her recipe for strawberry cake is delicious." is a less awkward English translation. Why is it incorrect? 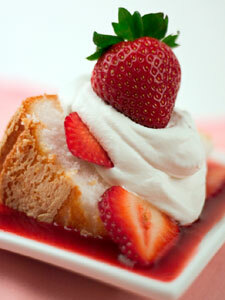 A strawberry cake is not always the same thing as a cake with strawberries. Perhaps because you can say fragokuko in Esperanto, too, if you want to. Ok, I guess I was thinking too much like Spanish, there.